Choosing a cage is one of the most important decisions you will have to make for your pet. Your hedgehog’s home and environment are one of the keys in determining the quality of life and longevity of your pet. You should discuss cage recommendations with your breeder prior to purchasing a new home for your pet. Plan on purchasing a cage from your breeder (who will appreciate your support) or have your hedgehog’s cage completely setup BEFORE bringing your hedgehog home. Your hedgehog’s cage MUST have a solid bottom. Hedgehogs’ feet are very different than other animals that can tolerate a wire bottom. Some enclosures have an open top. An adventurous hedgehog may try to escape. We believe it is easier and safer to prevent an escape than to locate a missing hedgehog. Keep in mind that hedgehog’s have piled things against the side of a cage in order to escape! Hedgehogs need plenty of room to move about and play. The minimum size recommended by most hedgehog enthusiasts is 24” x 24,” which equals 576 square inches, or four square feet. Some recommend a minimum of 24″ x 42′ which is 1,008 square inches. Many years ago some people recommended 10 gallon aquariums which does not provide nearly enough floor space. 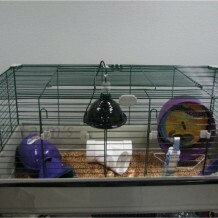 Your cage should have enough room for a wheel, litter box, and sleeping bag or nest box, and eating area. Smaller cages don’t have room to accommodate cage accessories that are good to stimulate activity which enhances your hedgehog’s quality of life. In the wild hedgehogs are reported to travel 4 to 7 miles per night in search of food, so it is best to provide the largest space possible for your new pet. Hedgehogs with plenty of room tend to be healthier and happier because they can exercise and explore. To double-check the size adequacy of your cage, simply measure the length and width in inches and multiply them together. Your cage size is adequate if that number is 576 or larger. Your cage is probably too small if the number is smaller than 576. Smaller cages have been recommended over the years (we were told to start out with a 10 gallon aquarium), but they are certainly not ideal and will not accommodate the recommended wheel, hidey places, toys, litter area, etc. Ventilation – plenty of air circulation is important for your hedgehog’s health. Ability to let in light – hedgehogs need a traditional day and night cycle. Cost – explore the various ways in which you can provide the most floor space for your pet to accommodate exercise and accessories. Ease of Cleaning& Disinfecting – if your hedgehog’s cage is a pain to clean, you will get tired of cleaning and either clean less or decide your pet is too much work. Escape Proof – you don’t want your new pet to escape! It is better to be cautious than sorry. Ease in Heating – you want to make sure that you can easily add extra heat sources so that your hedgehog always stays warm. Safety – make sure your hedgehog’s cage has no sharp edges or holes. We also strongly suggest evaluating the pros and cons of cages with ramps, levels and multiple layers. Also, it is important to safe guard cages with horizontal bars. Your hedgehog will try to climb these, and can fall and injure himself or herself. A good solution is to line the bars with vinyl. (More can be found about this topic in our Climbing Objects and Multi-level Cages article).